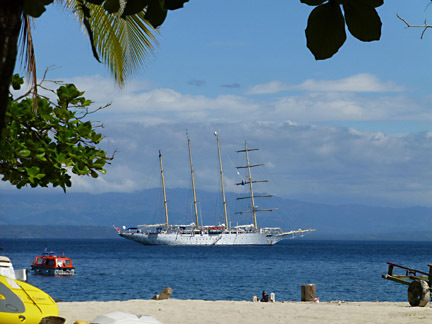 A half dozen huge white sails drove the 320’ four masted schooner north up the pacific coast of Panama towards Costa Rica through Tiffany box blue water. As an early riser, I arrived on deck just as the sun broke over the coastal cliffs. I grabbed a cup of coffee and a croissant in the main salon lounge before heading up to a higher deck to enjoy the poetry of a morning under sail. Alone on deck, I could fully appreciate this lovely craft for what it was, a real sailing vessel. Although positioned as a “cruise” you will find no gambling casino here, no mall or arcade, just the beauty of a seaworthy ship as it does what it does best, under sail. 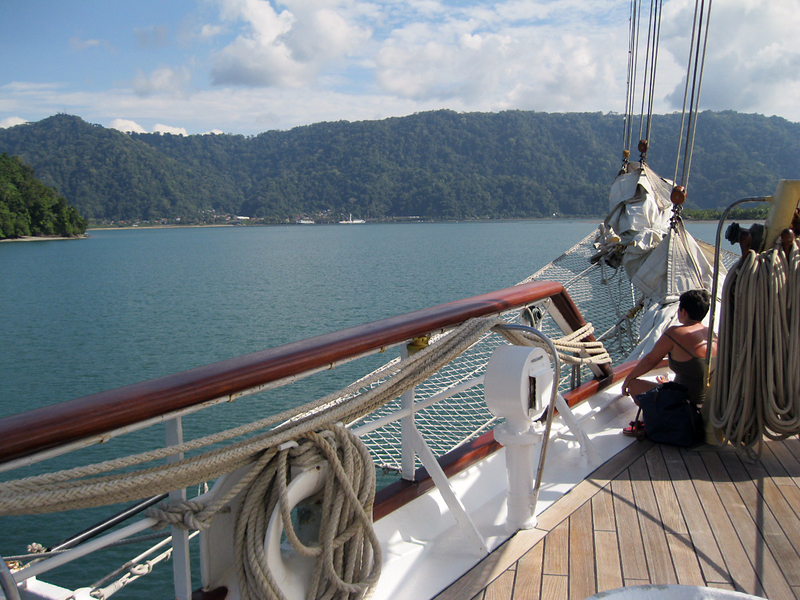 We had boarded the afternoon before, leaving Balboa Panama before dark. Luggage arrived at our handsome cabin and we changed out of travel weary clothing to explore our home for the next week. Our cabin had a very nice “head” (bathroom), many closets and storage spaces, a dresser and two comfortable beds. It was compact, as most sailing ships are, but very functional and comfortable. On deck hors d’oeurvres and cocktails were served at the Tropical Bar where Charly played music on his electronic keyboard while we met many of our companions for the week. The ship carries up to 100 guests, which is a great size as there are plenty of people to meet, but not so many that you get lost among them. We decided to dine with the people we met at the bar that evening, and as suspected, they were a bit more adventurous, interesting and frankly, humorous than you would have found on a “celebrity cruise”. Dinner that first night was a delicious surprise. The dining room is a throwback to old fashioned European luxury with brocade curtains, gold velour fabric seats, starched white table cloths and heavy silverware. The dinner menu offered several options for a wide variety of pallets, accompanied by wonderful wines that came in cobalt blue bottles with the ship’s logo on them. All guests enjoyed this elegance in casual evening attire. The cumulative effect is quiet dining, interesting multi course offerings, perfect service and a charming experience. Just when you thought you couldn’t touch another bite, your waiter hands you an irresistible dessert menu! It confirmed for me that this was not any kind of weight loss excursion. Days began with breakfasts being an enormous buffet of hot and cold choices along with an omelet bar where a chef makes custom egg dishes for each guest. Lunches always had a large salad bar including all of the elements to make up any kind of sandwich you could think of, and then of course there was the luscious lunch menu offered by your waiter. At 5 PM everyone gathered on the main salon deck for cocktails and hors d’oeurvres. Dinner started at 7:30 or so followed by live music in the lounge courtesy of the irrepressible Charly, and if there was any possibility that you might still be hungry at midnight, there wa s a large buffet presented. Honestly the food never ends aboard Star Flyer! Each day was filled excursions which were mostly about exploring coastal nature. 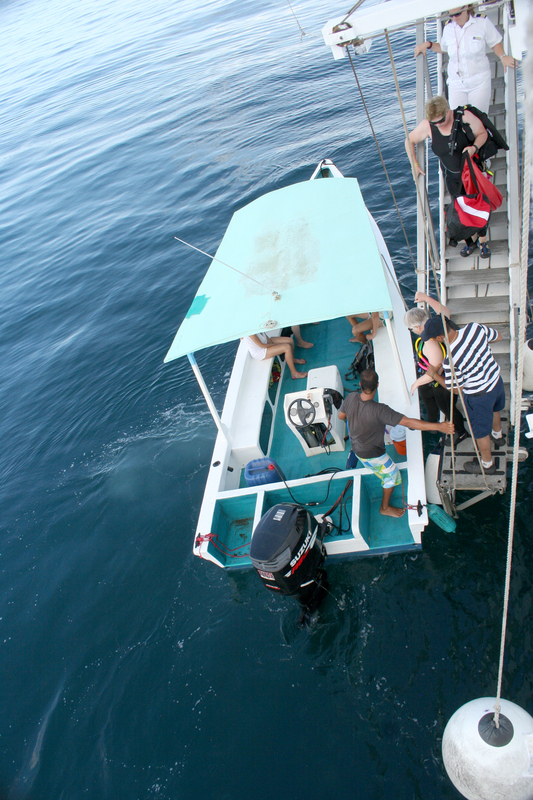 There were whale watching trips, picnics on islands, a zip line through the Costa Rican canopy opportunity, swimming and snorkeling and a bit of shopping ashore. Each day ended with the dramatic ceremony of raising the sails and setting back out to sea. One evening our captain brought his bagpipes on deck and piped the sun down as the enormous sails unfurled and began to catch the wind. Made my heart sing. Captain Klaus Mueller spoke elegantly on the subject of the rare opportunity presented by sailing for living with the cycle nature. The world beyond the rails slowly drifts from your mind as the salt air, and rithmic waves fill days and nights. During the week we saw dolphins alongside the ship on several occasions as we all slowed down, giving time to watching the sea roll by and the sky migrate from cool morning colors to mid day fierceness into warm glorious sunsets. After dinner guests would frequently gather on deck to watch the stars and enjoy an aperitif. I am an experienced cruise guest, and an avid sailor, with thoroughly salty blood. 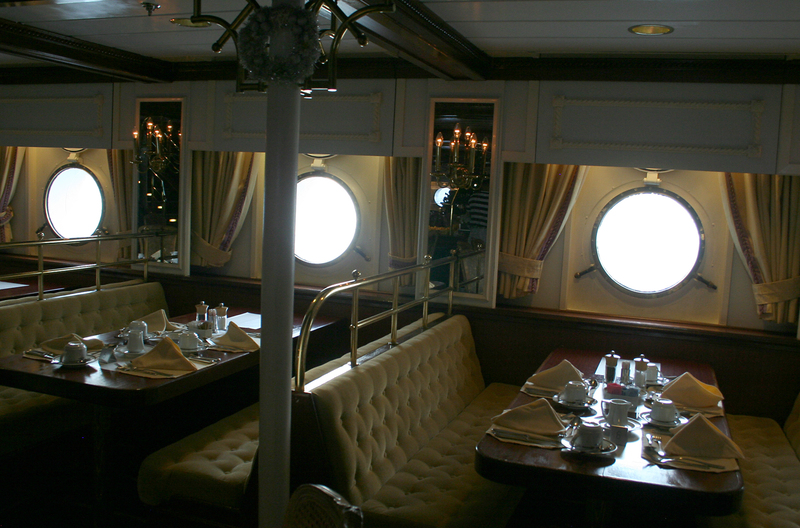 My first thought about the other guests on board was that they would also be sailors but I was surprised. While many were sailors, this luxury yacht provided a wonderful travel platform for people who just want to enjoy a different kind of travel luxury, something slower and more organic. It appears that they were surprised as well by how gentle and slow their thoughts became under sail. With slightly more than a hundred people on board, I met two people who had never even been off the land before, a few people who had cruised before but never under sail, and several who used to sail often but due to age, injury or arthritis just could not continue sailing. The compliment was large enough for a nice mix and small enough that we made real friends, the kind we will see again. 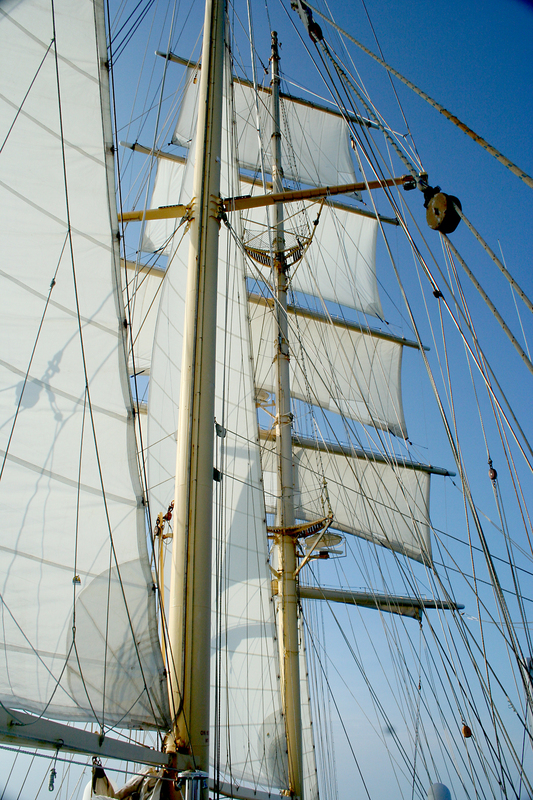 There are three Star Clipper Sailing Yachts and they move around the planet all the time. You can join a leg of the trip, or just stay aboard. When we boarded in Panama about half of the people we met had come from the other side of the Panama Canal. Some had come all the way from the Med! When we left the boat, many were staying on for the next leg of the journey north. It was a charming (if fattening) week and I would highly recommend it to anyone looking for a relaxing passage at sea. The boat schedule is posted on their web site so you can pick a leg to join on any of the ships. Flyer is the smallest of the fleet, but I am sure the quality of life, the extraordinary culinary delivery, and the attention to detail around every guest’s enjoyment is the same on any of the ships. Perhaps our paths will cross out there under four masts as certainly this particular “lemming” will head for the sea again!